As the world population grows and concentrates in urban areas, cities are facing ever increasing challenges to manage the adverse impacts resulting from continuous environmental, economic, and social changes. Environmental shocks and stresses, such as climate change and other natural and man- made disasters, can pose significant threats to the lives of the urban population. To maintain and promote the social, economic, and environmental wellbeing of cities, there is an urgent need to strengthen their capacity to respond to such challenges as well as to prepare for potential risks in the future. The importance of urban resilience and climate resilience has been highlighted in recent international agreements: Sendai Framework for Disaster Risk Reduction 2015-2030, the 2030 Agenda for Sustainable Development (2015), the Paris Agreement (2015), and the New Urban Agenda of UN Habitat III (2016). In response to such calls, cities are mainstreaming resilience in their policy making and proactively taking actions to transform themselves through various global efforts, including the Making Cities Resilient campaign (UNISDR) and the 100 Resilient Cities project (Rockefeller Foundation). One of the tools to help achieve such goals is technology. For example, the technology deployed in the provision of urban environmental services that withstand extreme conditions has a critical role to play in the promotion of urban resilience. In the waste management sector, technological innovation can help reduce the emissions of greenhouse gases during the treatment processes, thereby contributing to urban climate resilience. In addition, by converting waste to energy through the process, clean technology can help further mitigate climate change impacts. 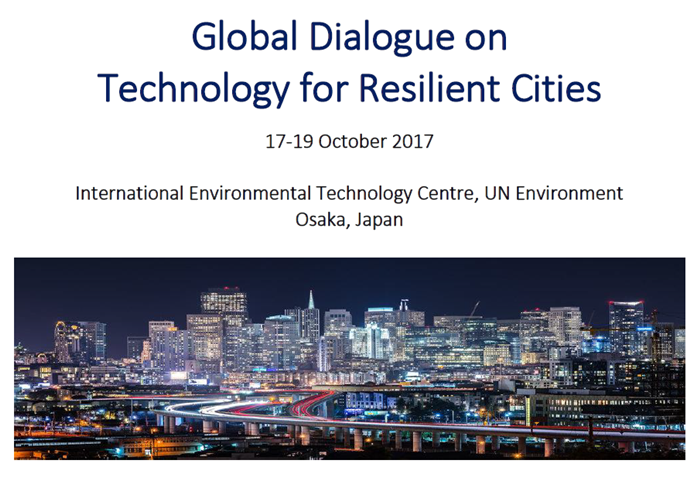 This Global Dialogue will explore how technologies can contribute to urban resilience against various environmental impacts. A focus will be given to climate change and other environmental impacts such as natural and man-made disasters. Although technologies in the waste management sector, as one of the pillars of the IETC programme of work, will have a prominent place in the discussions of this Dialogue, other technologies and approaches are also within its scope.